1915; 316 pages. Genre : Classic Literature; Free Verse Poetry. Original price of this book (1962) : 95 cents. Used price (2009) : $2.00. Overall Rating : B+. I've wanted to read this book ever since Julie posted her review here last November. The book consists of 244 epitaphs from the graveyard in fictional Spoon River, a small town in Illinois. Edgar Lee Masters summons up a wide variety of characters from his present clear back to the Revolutionary War. There are arsonists, drunkards, murderers, pioneer women, artists, immigrants, atheists, farmers, politicians, mayors, clergymen, businessmen, a black, a Chinaman and a fiddler; just to name a few. Spoon River Anthology captures the essence of small-town life from a century ago. Which is remarkably similar to the essence of our modern-day life. The dead speak to us from their graves, and their musings cover a variety of topics. Some tell us how they died, others tell us about their spouse and family. A few confess long-held secrets. Some even use the opportunity to gossip about others. Masters does some loose arranging of the epitaphs, starting with the mundane people who fret about things like who they're buried next to, and why they don't have a fancier headstone. The epitaphs then head upward, finishing with those who choose to give us a short, inspirational message. He even manages to hide his own epitaph in the book (Percival Sharp), and those of his grandparents (Lucinda and Davis Matlock). The dead are not all-knowing. Roscoe Purkapile makes up a tale about his being kidnapped by pirates. He writes how, when he came back to his wife after a year, she showed true love by blindly accepting his story. Mrs. Purkapile then reveals in her epitaph that she didn't buy one bit of his malarkey, but stayed with the scamp (he was having an affair, which he somehow failed to mention) only because of her marital vows. The book has its flaws. Masters gets overly flowery and philosophical at times, as he waxes Miltonesque. And the last 40 pages of the book cover something called The Spooniad (presumably a take-off of The Iliad) and the Epilog. The former is a re-hash of the 244 epitaphs, and who knows what the latter is. For me, both were a waste of time. the clown, the boozer, and the fighter? Edgar Lee Masters was a one-hit wonder. Spoon River Anthology was an instant hit, but he never came close to writing something of equal appeal and skill. Yet he had an affinity for the common man the way Steinbeck did. The rich, the powerful, and the religiously hypocritical generally don't fare very well here. This is a book for us plebians. Only the Spooniad and Epilog keep this from being of "A" quality, so I'll rate it a B+. I still recommend it highly; just feel free to skip the last 40 pages. 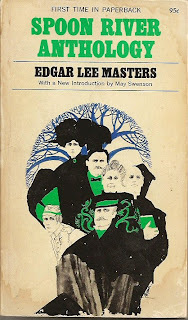 Edgar Lee Masters died in 1950. What follows is the epitaph his family put on his tomb, taken from one of his poems, "Tomorrow is my Birthday". It isn't from SRA, but is a nice example of his writing. "Good friends, let's to the fields - I have a fever. I pass you like an orange to a child. I can no more with you. Do what you will..."
they call it poetry, but to me, it wasn't. IMHO, "free verse poetry" is an oxymoron. here's one of the shorter epitaphs (for Chase Hemry). Which bring honor to the dead, who lived in shame.". Yeah, i guess it's got meter. but it's more of a story than a poem. Something about the poetic form prevents me from being able to understand the words. It's like my brain goes fuzzy. I'm excited to read this because I do love poetry, free verse or not! I'm glad you found a copy of the book to read. Your review is so much better! I always appreciate your insights and I loved the quote you used to close out your review. I also agree with you about those last 40 pgs. and I liked that the "The dead are not all-knowing" too. Rebecca - if you do read Spoon River Anthology. i'd be interested in your opinion of it. i'm not a big poetry reader, but a goodly portion of these epitaphs had a story to them. OTOH, there's also quite a few (especially towards the end) that are just pure poetry. Julie - you listed your four favorite epitaphs in your review. i re-read them just before i wrote this review; i thought they were good choices.